American Bridge, a Democratic SuperPAC that’s chaired by former Gov. Jennifer Granholm, has her old stomping grounds in its 2020 sights with a big ad buy in the Upper Midwest. Republicans also are targeting vulnerable Dems on impeachment — including two in Michigan. And President Donald Trump is facing off with the domestic auto industry, but it could cost him. It’s all in the Michigan Advance‘s periodic roundup of national news that’s so popular, it even serves as an assignment editor for other publications. 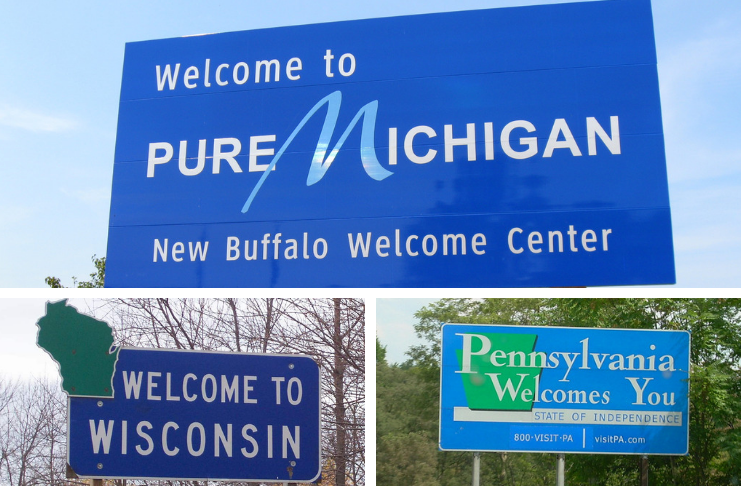 American Bridge has launched a $50 million campaign in Michigan, Wisconsin and Pennsylvania — three states key to now-President Donald Trump’s victory in 2016, NBC News reports. The effort is aimed at softening Trump’s support among “white working-class voters in the Upper Midwest. “We understand that we may not win these voters back entirely, but if we don’t make inroads into these areas, we will win the popular vote, lose the Electoral College, and the Senate could be lost for a decade,” the group wrote in a memo to prospective donors obtained by NBC News. … That $50 million expansion will go toward a massive paid advertising campaign on TV, digital, and radio, officials said, as well as other efforts to persuade rural and exurban voters in Wisconsin, Michigan and Pennsylvania — with the possible addition of Florida — that Trump has been harmful for their economic interests. The SuperPAC was founded by David Brock, a former fierce critic of President Bill Clinton, who became a key ally. The board is led by Granholm, who served as Michigan governor from 2003 to 2011 and now mainly lives in California, where she grew up. American Bridge is staying neutral in the Democratic presidential primary. The 2020 Democratic National Convention is slated to be held in Wisconsin, in another sign of how critical the party views the Upper Midwest. Tlaib has said she will sponsor impeachment legislation. Roll Call reports that freshman U.S. Reps. Haley Stevens (D-Rochester) and Elissa Slotkin (D-Holly) are among the 55 Democratic targets. An example of the digital ad, shared first with Roll Call, opens with on-screen text of Michigan freshman Rashida Tlaib’s remark that Democrats will “impeach the motherf—-r” juxtaposed with Speaker Nancy Pelosi’s recent declaration that Trump was “not worth it” when it came to impeachment. President Trump’s tariffs on steel and aluminum “have cost Ford and GM about $1 billion each,” Politico reports. Now his “attempts to save manufacturing jobs have battered the auto industry and could erode his loyal base in the Midwest,” according to the story this week. Potentially making things even worse, Trump is now weighing new tariffs on foreign automobiles that could threaten hundreds of thousands of additional U.S. jobs. … Even when 80 percent of a car’s component are American-made, the Michigan-based Center for Auto Research calculates, a 25 percent tariff on imported auto parts would increase by nearly 4 percent the price of a $35,000 car. Dan Ujczo, a Columbus-based international trade lawyer, says further tariffs would send Ohio into recession and jeopardize Trump’s re-election chances. The story notes that despite layoffs at Ford and GM, the news isn’t all bad in the auto industry, citing the $4.5 billion planned Fiat Chrysler Automotive expansion in metro Detroit.